Police have asked for assistance in relation to a ram raid at a Dungannon car dealership in which a number of high value vehicles were taken. 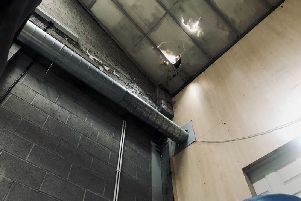 What police described as a ‘significant burglary’ took place at Moyway Motors, Moy Road, Dungannon in the early hours of Monday..
A police spokesman said: “Shortly before 5am this morning, Monday, April 16, it was discovered that entry had been forced to the premises and five vehicles stolen. It is believed that the incident occurred at around 3am. Two cars, a white Audi A6 and a black Audi A6 remain outstanding, the spokesman said. Sergeant McKinley is appealing to anyone who witnessed the incident or anyone who has information about the location of the two Audi A6 cars to contact officers at Dungannon Police Station on 101, quoting reference 145 16/04/2018. It’s understood a Ford S-Max was used to ram the gates at the dealership before the vehicles were removed and taken in the direction of Dungannon.